I am a 3rd year PhD student at the Australian Regenerative Medicine Institute, where my focus lies on the genetic mechanisms regulating muscle generation, using the zebrafish and various shark species as my models. Before PhD, my undergraduate experience was also genetics and developmental biology, providing a strong background in academic science. In my experience, many academic environments may have high quality biomedical research but have limited links to industry, and as such miss some of the translational potential that exists in basic science discoveries. It is as if academia and industry speak different languages, with the former being ‘too blue-sky’ and latter ‘too narrow’. 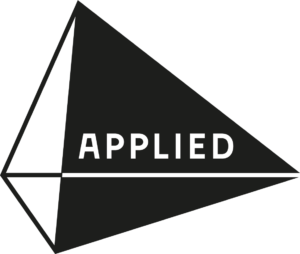 This academia-industry gap motivated myself to understand why this gap exists, and to satisfy my curiosity as to what are the key career aspects of an industry-related position. As a result, I am a mentee participating in the CCRM Australia-IMNIS international mentoring program specialising in Regenerative Medicine, and I have monthly online meetings with my international industry mentor. Recently, I was invited to visit the new CSL building at Bio21 by the Vice President of Research at CSL, Michael Wilson. This was a fantastic opportunity, and it was exciting to meet a high-profile industry fellow that emanated enthusiasm and passion for the research goals of CSL. At first, I felt somewhat in the deep end in that the research conducted at CSL, particularly methods such as human or mouse cell culture, or drug screening, could be viewed as quite different from my technical background in developmental biology. However, the underlying scientific strategy was very relatable, in that there needs to be a strong basic science foundation before CSL can invest in a product concept with confidence (scientific controls are necessary!). Also, similarly to the evolution of an academic research project, later experimental steps create new findings that build on this initial idea, clarifying the form of the final product (academic publication and/or in particular, a commercial drug or therapy). 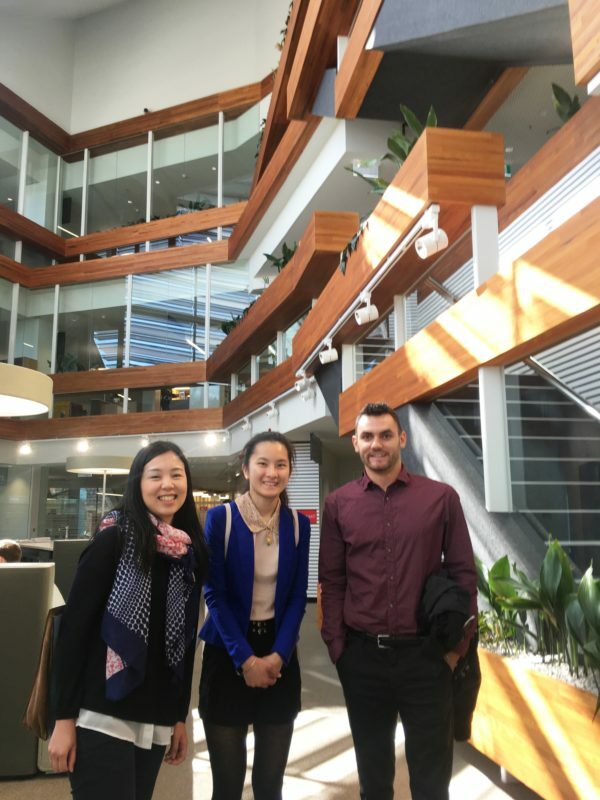 IMNIS Mentees at CSL’s new laboratories at the Bio21 Institute in Parkville. There were two skills that Michael had suggested to be necessary for industry-related careers. Firstly, being highly adaptable to new situations, so that when you encounter a hurdle, you can hop back onto your feet and keep moving. Any science career involves formation of new ideas, so it is essential to be open to all perspectives and learn on the spot. The second necessary skill is to network, helping to maintain open lines of communication between different academic and industry parties so that everyone has clearer goals, and can contact experts regarding specific topics. Sam and CSL Vice-President of Research, Dr Michael Wilson. Overall, this opportunity showed me there are surprisingly more similarities than differences between academic and industry environments. Each plays a key role: academic science forms the foundation in which industry can work from to produce a commercial product. This really stresses how important it is for academia and industry to communicate and cooperate, so that we can get the best from both worlds. I am grateful to the CCRM Australia-IMNIS program for the opportunity to tour CSL, and also thank Michael Wilson for his time. Sam Keenan is a New Zealander with a Master of science background in developmental biology, where he investigated limb developmental patterning and phenotypic mutations, using the frog as a model system. 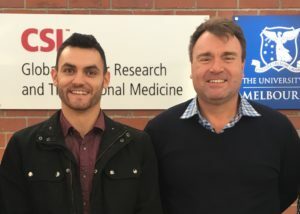 Sam is currently in his third year of PhD in Melbourne, under the supervision of Professor Peter Currie. 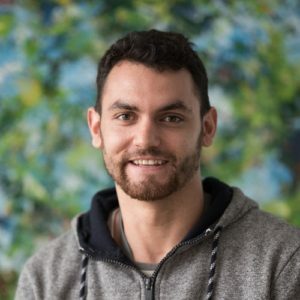 His PhD project investigates the developmental genetics behind how muscle tissue is formed, specifically how the muscle cell precursors form and fate towards later differentiated states. Additionally, this project looks at the evolutionary history of muscle patterning amongst vertebrates, using the shark and zebrafish as model systems. Sam’s work experience prior to PhD varies from NZ eel handling, quail facility maintenance, frog handling, dairy farming, forklift driving…etc.